Do you like sudoku, but are looking for something a little bigger than the standard grid? 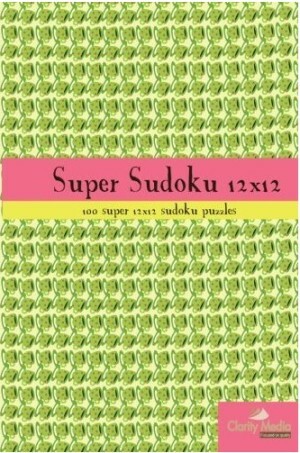 Then why not try our fantastic collection of 100 new 12 x 12 sudoku puzzles. Although very rarely seen, these puzzles solve just like normal sudoku only the grids have 144 squares in them, as opposed to 81 of the standard puzzles, and you place the numbers from 1 - 12 once each in each region of the puzzle, as opposed to placing the numbers from 1 - 9. This means that you'll need to be more diligent with your pencilmark solving than with the standard grids, but none of the puzzles in this book require guessing or anything more than careful application of the standard solving rules you'll be familiar with from solving smaller sudoku. How Super are Super Sudoku? We hope you'll find that they are really super! Remember that if you'd like to try a puzzle before you buy, then you can: simply click the link above and print off and enjoy. Be sure to print at 100% if you want to see exactly what size the puzzle grids are in the book. Of course, you can also use the look inside feature on Amazon to take a look at the contents of the book before deciding whether it is for you or not. 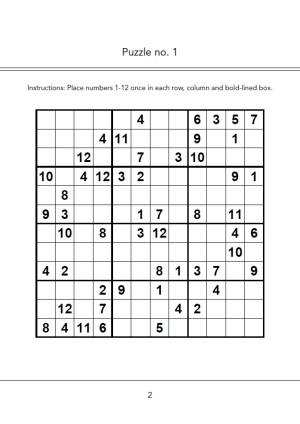 These puzzles are ideal for those who are looking for something a bit more challenging than the 9x9 sudoku puzzles, so please do print off and see what you think. Did you buy the book? If so, let us know what you thought - would you like to see another one, or perhaps you have an idea for something else you'd like to see? We're always open to ideas, so please do share your thoughts with us via the contact page on this site. For those who are looking for even more of a challenge, please take a look at our full sudoku range outlined in the left hand menu of this site: we have even larger puzzles going to 16 x 16 and even 25 x 25 sudoku grids. At the same time, we also have puzzles that are larger because they contain many overlapping grids: thus you might be interested in our puzzle books that contain any of 5, 11 or 13 overlapping sudoku grids within them. We aim to cater for all puzzling tastes, from those looking for small and quick puzzles right up to large and time-consuming puzzles.